Knauf Cleaneo Akustik, combines aesthetic appearance, air cleaning and high sound absorption properties to reduce sound reverberation. And the new generation of Knauf Cleaneo Akustik Seamless plasterboards have a unique FF Edge profile, a lapped edge on two sides of the panel, helping to ensure boards are correctly spaced and minimising the amount of jointing material required to create a perfect seamless finish. The Knauf Cleaneo Akustik Seamless range offers seven sizes of circular straight line perforation, five with one perforation size, two with two perforation sizes and two with a random circular perforation. There are also two sizes available with square line perforation. 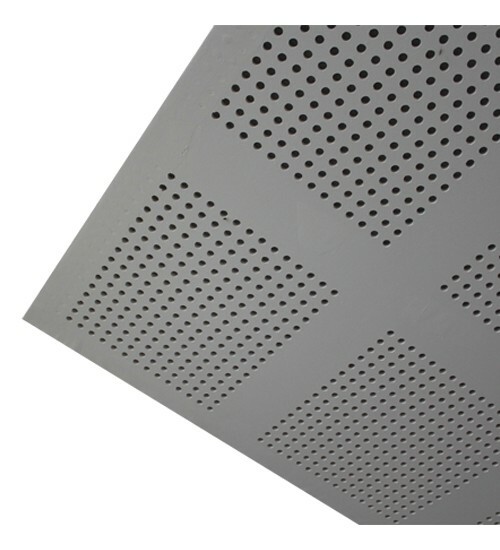 They are supplied backed with an acoustic lining in either black or white. Each board has precision engineered edges to deliver a unique seamless finish when jointed with Knauf Uniflott.